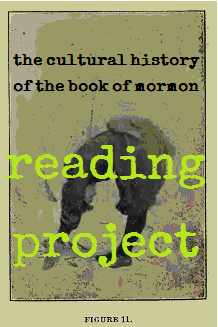 The next installment of the Reading Project of the cultural history of the Book of Mormon, Volume 2A. Happy reading. Volume 5 should be available by April 1st. I’ve reached the section on referential congruence and linking practices. It seems evident that the Book of Mormon itself is voiced very much in a Bible style, in some places borrowing extensively from the KJV. Some critics find the book to be more Biblical in its style than the Bible itself, suggesting a conscious effort to ape biblespeak. Do you think this style was necessary for the Book of Mormon? Do you think this voicing was added by Joseph Smith or Oliver Cowdery during the translation process in order to “muster authority,” or do you think the voicing itself was translated? It occurs to me that those who are familiar with this dignified Bible writing, and who tend to take it seriously, would also view texts written in that style as part of the same biblical fabric, as it were. In other words, “referential congruence” is already suggested by the text itself, facilitating some of these linking practices, especially #4 I think. What if the Book of Mormon had been voiced differently from the beginning? Excellent questions. I think it was designed to voice the Bible, for two reasons. The first, as you point out, would be necessary to make the text acceptable to Bible-lovers of the 19th c. Had the BoM been voiced differently, I think it wouldn’t have been accepted as “scripture,” and not integrated into a “religion,” for better or worse. It seems like it was probably the only way for the BoM to reach any readership at all, reading it as something more than “literature” or “romance.” If we look at Mormons today who want to keep the BoM, but only on terms as a fictional account, we can see it has little effect on them, other than to shore up what they already believe (or don’t). By voicing the Bible, it could enter into dialogue with it, by copying passages outright it makes a statement about its own authority being voiced; and by offering a story of the Brass Plates, it gives a history of where its text come from. This takes us to the history of the book of the Lamb, corrupted by the G&A Church. With these histories and styles working together, we can suppose the BoM is designed to reach Bible readers, and to get them to imagine something different: for the Bible’s history, and for the future of the BoM as a text free of the Bible’s metatextual machine. It all seems to point to a voicing of a different sort of authority, one long-suffering and patient, and willing to speak to us on our own terms, confused though they be. Contrast the implications of this–on a priesthood, on a readership–with that emerging from fundamentalist Bible Christians, who would use every modern from of power (money, politics) to propel their book, as they interpret it, into every voice.